Climate change interest has waned dramatically, yet just a few years ago it had captured public attention. Now it seems only to have nuisance value. We know interest has declined but there is a neat way of illustrating by just how much. Google trends, a neat free tool from you know who, generates data on the volume of searches from 2004 to present for a given keyword. Here are the numbers for ‘climate change’. The data are not search volume but are proportional to the peak of search activity over the period — in this case the peak searching occurred in December 2009. The low numbers are periods when there was less interest in the term relative to the peak. Any upward or downward trend in the data shows that the term is growing or waning in popularity. Included on the graphic are a few key events including the various UNFCCC Conference of the Parties (COPs) that have been an end of year special now for some time. Interest in climate change interest was modest until Al Gore released An Inconvenient Truth in 2006. 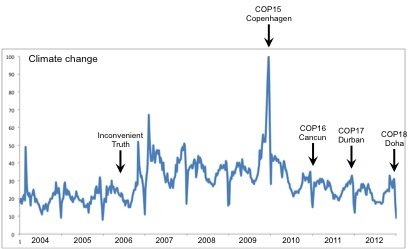 That tweaked our curiosity and searches on climate change increased until the peak of traffic around the time of the COP in Copenhagen. This was when then Australian Prime Minister Kevin Rudd was calling climate change ‘the greatest moral challenge of our age’. This was the peak of climate change interest and since then there have been three more COPs in Cancun, Durban and Doha. Yes three more high points on a steady decline towards pre-Al Gore levels of interest in the topic. Google trends also provides information on where the searches come from by country. Interest now comes mostly from the developing world with 8 of the top 10 countries by search volume from Africa. Statistics can also be amusing. After each COP search volume declines as everyone in the northern hemisphere tucks into Christmas turkey. There is also disinterest in the northern hemisphere summer when its warmest! Not even Google can predict the future but the trend for interest in climate change suggests that searches are stable at around 20% of that Copenhagen peak. There is a hint that the trend is declining and that interest could drop away further. So much for the greatest moral challenge of the age.